The following review is based on a copy provided by the publisher via NetGalley in exchange for my honest opinion. Thank you, Tor Books! I was first drawn to this book by the promise of a historical San Francisco and ghosts. It’s been a while since I last read a ghost novel, and Delia’s Shadow turned out to be so much more than that. Jaime Lee Moyer did a great job blending historical fiction with crime, mystery, paranormal, and a slow-building romance. The novel begins with Delia returning to San Francisco and her friend Sadie, whose family took her in after her own died in the great earthquake of 1906. Delia is haunted by a spirit she calls Shadow, a ghost stronger than any other she has encountered thus far. She feels drawn to Shadow and wants to help her find rest, but she is also afraid of her. Sadie knows about Delia’s ability to see ghosts and sets up a meeting with Isadora, a talented medium, to help her keep the ghosts at bay. Isadora was a mysterious character and I came to like her and admire her strength, though sometimes it was unclear how trustworthy she really was. The friendship between Sadie and Delia was also something I enjoyed, as all too often in my opinion friendship between women in fiction has an undercurrent of rivalry that I dislike. Something I wasn’t expecting is that Delia’s Shadow is narrated in dual perspective. Delia’s parts are written in the first person, while those of Gabe, one of the detectives investigating a series of murders, is written in third person. I’m not sure why the author didn’t settle for the same person in both cases but I really enjoyed getting to know both characters better. Gabe is the friend of Sadie’s fiancé and like Delia, he lost those he loved in the Great Quake. I really liked Gabe as a male lead and enjoyed seeing him slowly let go of the past and open himself up to the possibility of a second chance at life and love. The relationship that starts to bloom between him and Delia was believable and well-balanced, in my opinion. He was protective of her but also respected her independence and accepted her help as he tried to find the serial killer leaving his gruesome trail across the city. Now the serial killer part was really creepy and what he was doing to the (mostly) women he murdered is just gruesome. I could never guess who the murderer was but I thought the hunt and the portrayal of the crime scene and police work that was possible at the time was really interesting and well-done. There were setbacks, twists, threats, and a point where things got a lot more personal for the characters and their families than I could have imagined. And all the while, past and present grow more closely linked and tragic events seem to be repeating themselves. There are times where the pace might be a bit slow for some readers, but I really enjoyed just being in the setting and time period. Also, many things were developing parallel to one another and I suspected they would end up being related, but couldn’t fathom how. I also thought it was great that I was never quite sure whom to trust, least of all with Shadow. There were times when I sympathized with her and others when I loathed or feared her. She clearly had her own agenda that needn’t necessarily be compatible with Delia’s. As I said, I think Moyer did a great job blending many different elements. A vivid historical setting (there are even maps! I love maps! ), a serial killer on the loose, two strong relationships, ghosts, and a hint of Egyptian mythology make Delia’s Shadow a unique read with characters that are easy to root for. While the pace could sometimes have been a bit quicker, things really pick up in the last quarter and I couldn’t put the book down anymore! The tight connection between past and present and themes of family generations, loss, and second chances tied the different plot threads together. I also liked the strong sense of friendship and loyalty portrayed by both the main and secondary characters throughout the book. 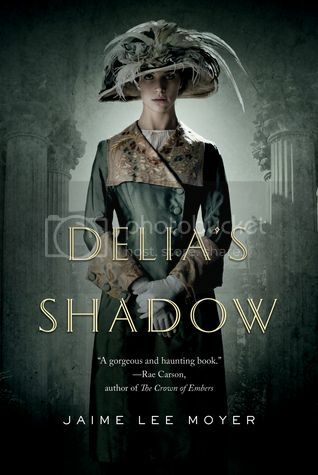 If you like historicals, slow-burning romance and a plot involving ghosts and serial killers that nevertheless doesn’t get too dark or slide into downright horror, you should give Delia’s Shadow a try! Oh historical fiction and a ghost story sounds very interesting. I am interested in the dual perspective. Delia's Shadow sounds like a very unique story and definitely is something I want to read.